It is so cold and snowy in St. Louis these days, I couldn’t resist the opportunity to warm up the oven for these ultimate comfort brownies. I am always looking for any excuse to bake and celebrate! 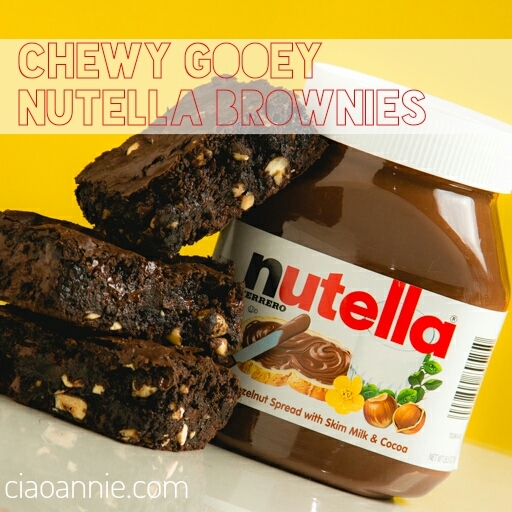 These Nutella brownies are a fantastic way to celebrate the merging of two cultures! Combining chewy chocolaty American brownies, with creamy delicious hazelnut Italian Nutella, is a fantastic tribute to our culinary and cultural histories. The Nutella flavor is somewhat subtle in these brownies, so don’t forget the chopped hazelnuts to really amplify the chocolate hazelnut goodness! Grease a 13x9x2 inch glass pan. Melt butter in a medium/large saucepan, over medium low heat. Add the sugar and stir constantly for 3-5 minutes. Remove from heat and stir in the Nutella. Stir in the eggs, cocoa powder, salt, baking powder, and hazelnut and vanilla extracts to the butter-sugar mixture. Stir vigorously until thoroughly combined. Slowly add the flour and stir until just combined. Stir in the chocolate chips and chopped hazelnuts. Spread the batter into the greased 13x9x2 glass pan. Confession of a *wannabe* foodie… How long can I justify celebrating World Nutella Day… a day… a week… a month?!? We stole and ate 2 brownies while babysitting at your house. Easily the best brownies we’ve ever tasted. Please leave more out next time !